Considered the hottest peppers in the world, habanero peppers have a slight citrus flavor, are usually red or orange in color and grow to about 1 to 2 ½ inches long. Habanero peppers are commercially grown in the Yucatan, Mexico, as well as in Costa Rica, Belize, California and Texas. Habaneros are easy to grow from seeds, whether indoors, in a greenhouse, or outdoors in tropical climates. The key to growing habanero peppers from seed is to keep the seedlings in a sunny spot, warm and well-watered. Soak the habanero pepper seeds overnight in warm water. Plant the seeds about six to 10 weeks before the last expected frost. Fill a seed tray with a mixture of equal parts garden soil, sand and vermiculite. Make sure the seed tray has drainage holes in the bottom. Plant the habanero pepper seeds about ¼ inch deep and about 1 inch apart in the seed tray. Water the potting mixture thoroughly. Cover the seed tray with clear plastic cling wrap. Place the seed tray in bright, indirect sunlight, such as a sunny windowsill. Maintain soil temperatures of 75 to 85 degrees Fahrenheit. Water the seeds every other day to soak the potting mixture. Remove the plastic wrap from the tray when the seeds germinate and sprout, which can take up to six weeks. Cut back to the soil level the weakest of the habanero pepper seedlings after they grow their first set of “seedling” leaves. Further thin out the weakest seedlings after they grow their second set of “true” leaves. Transplant the strongest habanero pepper seedlings into individual 6 inch planter pots after they develop their true leaves. Keep the plants moist at all times and warm. Habanero peppers are tropical plants, so you'll need to keep temperatures warm and humidity levels high. Mist the seedlings with a water spray bottle each day to increase the humidity around the plants. Always wear protective gloves when you're handling or harvesting the habanero peppers. 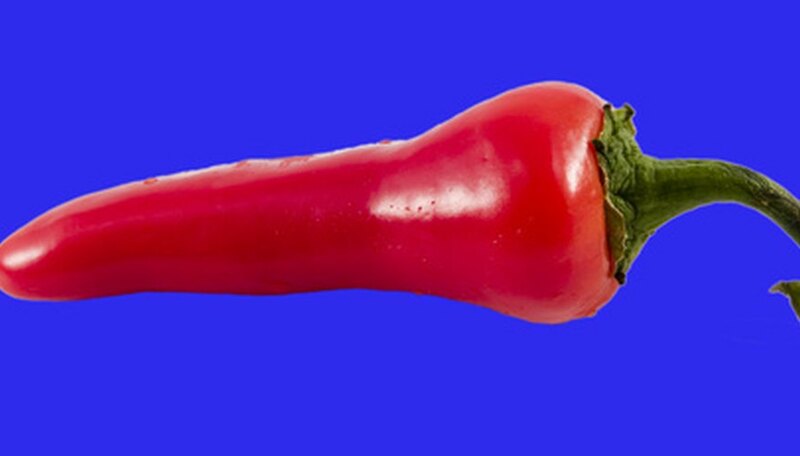 These peppers can burn your skin and eyes.